On May 5, 1993, three young boys playing in West Memphis, Arkansas, never made it home for dinner. The loyalty of an entire community spurs hundreds of people to begin a frantic search for the missing children. All hope is crushed the next day when the three families come to the harrowing realisation that their boys have been murdered. In a rush to convict the killers, police focus on a trio of devil worshipping teenagers. As the mother of one of the murdered boys (Reese Witherspoon) tries to come to grips with this unspeakable tragedy, she desperately believes that the killers have been found. It is only when an investigator (Firth) reveals that the evidence doesn't add up, that the community is forced to face the reality that the true killer might still be out there. Competition opens at 5pm AEDT on Sunday 16th November 2014 and closes at 11:59pm AEDT on Sunday 23rd November 2014. Three winners will be chosen at random on Monday 24th November 2014. To successfully win, entrants must fulfil the above entry conditions before the time the competition closes. Current members/followers are eligible to enter the competition. Only one entry per person. Only one winner per household. To be a valid winner, the entrant must not have won a prize from SWITCH within the last 28 days. Each winner will receive one Blu-ray copy of 'Devil's Knot'. By entering, you agree to receive occasional emails from SWITCH in the future. If you decide to unsubscribe from these updates, any further entries will not be applicable. Only Australian residents are eligible to enter. 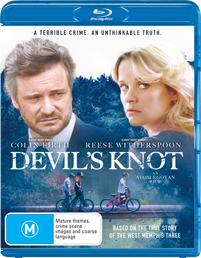 'Devil's Knot' is available on Blu-ray, Digital and DVD on Wednesday the 19th November 2014 from Icon.